Do you recall those subscription bundled Archos tablets I reported on a few weeks back? I just found out how the Philly Media Network managed to build the platform and ship it so quickly. They were the first publisher to sign up with PubTab, a new program that enables publishers to bundle their content with a tablet. PubSub is a partnership between TigerDirect and Archos, the French tablet maker. One brings marketing and retail experience and the other brings their practical knowledge in short production runs. Together they have created PubTab, a turnkey solution that lets publishers bundle content with an Android tablet. I have to admire the simplicity of this program, as seen from the publisher's viewpoint.They don't have to do much beyond sales promotions. PubTab handles everything from ordering the tablets from a Chinese builder, loading the apps and content, warehousing the stock, all the way to processing orders and shipping the tablets to the the publisher's customers. 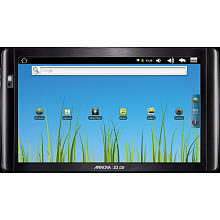 PubTab is currently based around the Archos Arnova 10 G2. It's a 10" Android tablet, and it is running Android v2.3 Gingerbread on a 1GHz RockChip 2918 CPU with a capacitive touchscreen. It has Wifi, 4GB Flash storage, a microSD card slot, a VGA webcam, and USB Host. I noticed when I reported on the Philly tablet offer that this tablet wasn't available in the US. It is now and the retail is $250. Now, there's no mention of any other Archos tablet being available through PubTab, but I suspect that Archos and TigerDirect would be interested in expanding it to include other size tablets. But before that happens Archos will likely need to arrange to get limited production runs from a Chinese manufacturer. That might take time. Looking at the Philly deal, I have to say that this looks like a fairly competitive price. In that deal you could get the tablet plus a 2 year subscription to all 3 of PMN's publications for $384. It's considerably more than the tablet itself but also a lot less than if you bought the tablet and subscriptions separately. It looks like PubTab is selling the tablets to the publishers for somewhere around the standard retailer discount - that old be under $180 in this case and I would bet that they have a commitment to X number of units. Publishers then get to price the bundle at their own rate and take a risk of not attracting customers. I have to say that I'm looking forward to when this pops up again. Hearst had supposedly planned to go it alone for a bundled tablet deal, and according to reports they had already invested millions in it. This would have been far cheaper and hit the market much faster. Google eBookstore Coming to the UK in October?